Derbyshire Pilates – Understanding your Pain!! Some simple things you can do now to start your recovery. As a clinical Pilates practitioner I use the principles of neuroscience to encourage desired postural changes and freedom of movement. This in turn encourages awareness of body movement liberating the spine, freeing the joints, connecting with the breath and easing muscle tension. Clients learn a mindful approach to movement, develop self-awareness, improve self-motivation, resilience and generally have more optimistic approach to life. Teaching the nervous system to recognise the body and tuning into healthy movement patterns has dramatic and positive life enhancing results. Teaching my clients how to manage their pain is a challenge, yet at the same time extremely rewarding. Certain patterns of brain activity reveal the complex interaction between musculoskeletal damage, the way we move, our perception of our pain and how it affects us emotionally. Pain has a deeper meaning and affects us on a personal level and impacts on how we carry out our daily activities, go to work, socialise and rest. This is how it works. The body picks up signals from the nervous system, which are interpreted at a physiological level. Our brain releases hormones and chemical messengers, our body then responds with pain or discomfort. Our perception of this alerts us to a possible problem that needs to be attended to. This can be in the form of pain, discomfort, anxiety, sleeplessness and a feeling of not coping. Depending on our interpretation we may seek the advice of a GP, Physiotherapist, Osteopath or other medical professional to seek answers for our pain. However, pain does not necessarily indicate damage or an underlying problem, it just maybe the body’s way of making us aware all is not well. For example, certain postural positions are unhealthy for us and contribute to our feeling pain and discomfort, not sleeping well and feeling fatigued. Over time this can develop into a real issue. For instance, one of the most common bad postural habits is our tendency to sit in a slouched position in front of the computer, with chin forwards and hunched shoulders, increasing our risk of developing musculoskeletal pain over time. Back pain is another common problem, resulting in more lost hours than ever before. It can be extremely painful and yet research has found that any two people having had an MRI scan of their lumbar spine showing a prolapsed disc, can report very different perceptions of their pain. Indeed one person can report no pain whilst another reports debilitating pain. So whats going on? The pain is certainly not all in our heads, so how can we cope with ongoing pain which has no underlying pathology. Pain can be made worse if we ignore the need to improve the way we move, sit, stand and care for our well being. Training your body to move well is an important part of reducing pain and remaining injury free. We can all get into bad postural habits but it doesn’t mean we cannot learn good postural habits that will reduce our pain and lead to a happier life. Your brain loves to learn new things and your body loves to move, so by developing your awareness of how you move, sit, stand, walk, play sport etc…you will enhance the way your brain connects to your body when you move. Exercise rehabilitation is a journey of discovery: it’s no quick fix and it needs to become a part of your every day life. You will get set-backs. Some days your pain is worse than others but it’s how you react to these that will determine your recovery. Having your own home exercise routine helps considerably. Learn to work with your teacher to adapt and modify your routine to suit your body and circumstances as they will inevitably change over time. From my own personal experience, having a horse riding accident many years ago set up a chain reaction of advancing wear and tear in my spine. I lived with spinal and nerve pain for many years until in 2016 when I had an Anterior Cervical Discectomy. I kept my business going, thanks to the support and care from a loving husband, support from friends and the support and compassion from my clients and students. Another factor was my own grim, and at times stubborn determination to keep going. The end result has been a success thanks to a marvellous surgeon. As well as seeing clients daily and running classes, I am training my body to return to scuba diving as soon as I can. I still have pain from time to time but it’s manageable so long as I keep moving! Sadly there is no magic pill. Keep a positive outlook. It has been said that “your life is what your thoughts make it”. Get support if you need it. Find a teacher who will teach you how to move mindfully, and gradually you will develop an inner resilience to manage your pain. The reward for training your brain to connect well with your body will be less pain and discomfort, better rehabilitation from surgery or injury, more fluid movement, less wear and tear on your joints, improved muscle tone and balance, consistently improved performance in sports and a feeling of wellbeing and equilibrium. So, don’t ignore postural pain and discomfort. Learn how to become more body aware, change habits that are not serving you well and start to lead a happy and fulfilling lift. Here are five simple things you can start to do to improve your overall health and well being and reduce pain. Take a brisk walk for 45 minutes daily. It’s good for cardiovascular health, mobilises the spine and joints, increases the happy hormones ‘endorphins’ and is great for general health and wellbeing. Oh, and its free!! Go for a swim. Its great for reducing impact on aching joints and improves overall mobility. Initially, exercise on a one-to-one basis with your teacher who will provide you with a tailor made exercise routine for home. Clinical Pilates and Therapeutic Yoga will help you gain confidence to join an exercise class. A class atmosphere will help motivate you to keep going, improve your body awareness, posture, breathing, muscle balance and tone, co-ordination skills, body awareness and general mental health and wellbeing. Dance as if no one is watching!! Join a dance class for fun and as an added bonus it will help you to improve your cardiovascular fitness, balance and posture. Its also a great way to socialise and meet other people. Relax. Take a relaxation or mindfulness course to develop your concentration, reduce anxiety and help manage pain. A time for quite relaxation should always be a part of your exercise regime. It gives your nervous system ‘down time’ to aid recovery and healing. 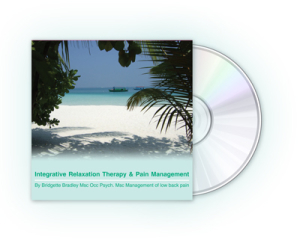 You may find my CD on ‘Integrative Relaxation Therapy and Pain Management’, a helpful aid. As with any exercise please take advice from your GP before starting any new exercise routine. If you have a specific condition or injury you should seek a health professional for advice before taking part in an exercise class.